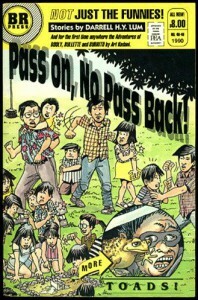 Book Review: Pass On, No Pass Back! Being a kid is complicated. There are rules, most of them unwritten, unspoken even, and heaven help you if you can’t unlock the secret code. Darrell H.Y. Lum not only has the key to the boy’s room in his collection of short stories in Pass On, No Pass Back!, he also has the contraband cigarettes. And maybe a little something else. The title refers to a kids’ game I remember well: somebody punches you in the arm, yells, “Pass on, no pass back!” and you have to find someone else to slam and pass it on. The playground politics in who you hit and how hard would make the UN weep. And Lum gets it. Better yet, he helps us get it. To anyone who grew up in Hawai‘i, Lum’s characters feel real. There’s tales of da Bag Man, karate class, scouts, toads, and mongooses from hell that still give me chicken skin. The stories are written in Hawaiian Pidgin English, a welcome sound of home for native speakers that adds another layer of authenticity to his words. Non-Pidgin speakers will have a tougher time, but it’s worth the work. As a bonus there are also the comic strip adventures of Booly, Bullette, and Burrito by Art Kodani. If you’re looking for authentic island writing, Pass On, No Pass Back! is fantastic. Pass On, No Pass Back! by Darrell H.Y. Lum is published by Bamboo Ridge Press and available as a trade paperback from the publisher, Amazon, and Barnes & Noble. 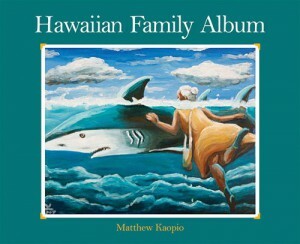 Matthew Kaopio, the author of Hawaiian Family Album, is an extraordinarily talented mouth-brush painter. His illustrations intrigued me enough to pick up his book, but as good as they are, they aren’t the heart and soul of his book. His book is classic talk story—kids bugging a busy grandma to tell them family stories from her youth. In the eleven stories presented here, Grandma passes down Hawaiian culture and traditions and teaches the kids how to find their way through many of life’s difficulties. One of my favorites, Kāne-o-kekai: Man of the Sea, tells the story of a woman’s fall into the sea and her rescue by a great white shark. It reinforces other opinions I heard as a child that sharks were to be respected, but not necessarily feared, and that ancestors are always ready to help. The stories are funny, scary, and heartwarming, the perfect length for just before bedtime reading for kids. If you’re looking for some authentic Hawaiian culture, this book’s a winner. Hawaiian Family Album by Mathew Kaopio is published by Mutual Publishing and is available as a trade paperback from the publisher, Amazon, and Barnes & Noble. When emigrants came to Hawai‘i they brought their food, their traditions, their languages—and their supernatural beings. Like the humans, the supernatural beings mixed and mingled with the locals and resulting stew is a ghost story hunter’s feast. 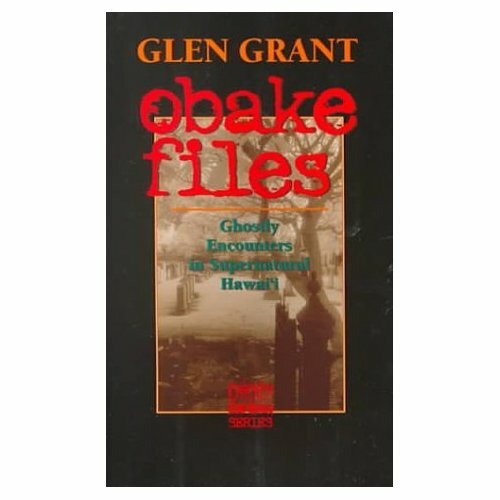 Obake Files by Glen Grant is a collection of his scholarly research into Hawai‘i’s supernatural world culled from first hand experiences, archives, and newspaper accounts over 25 years. The spine-tingling, chicken-skin tales are told in a matter of fact tone that makes them far scarier than any horror novel. You’ll find stories of fireballs, haunted houses and buildings, calling and choking ghosts, night marchers, ancestral bones, and modern encounters with Hawaiian gods and goddesses. As any Hawaiian will tell you, there’s more to our world than meets the eye. Grant’s collection is reminiscent of the stories I heard—and the things I experienced—living in Hawai‘i. The encounters are broken into short entertaining segments perfect for on the go, got a minute reading. Obake Files by Glen Grant is published by Mutual Publishing and available as a paperback directly from the publisher, Amazon, and Barnes & Noble.